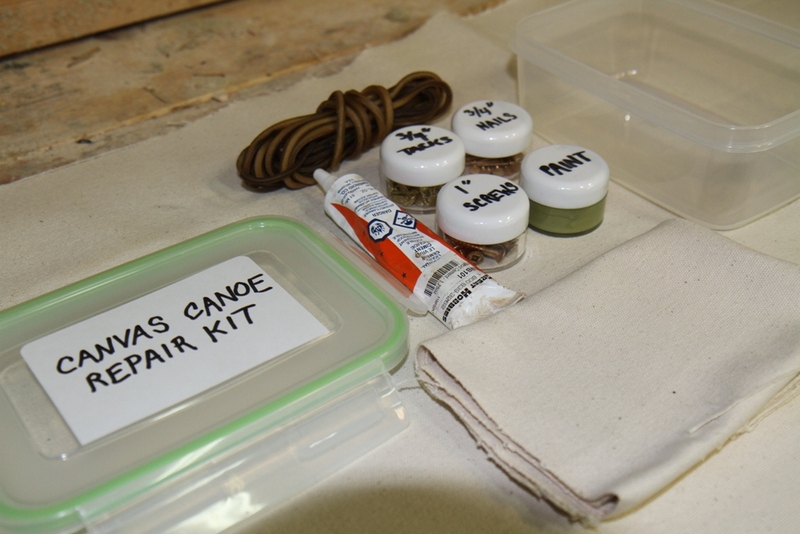 While restoring a 1905 J.H. 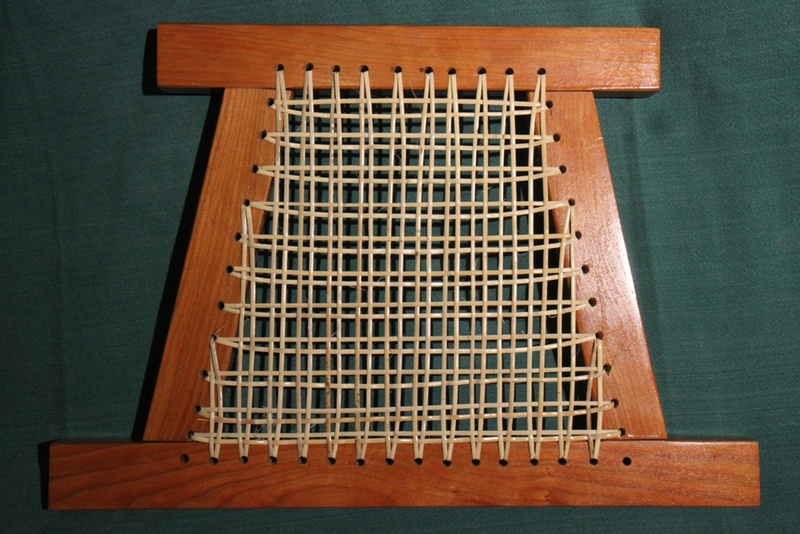 Rushton Indian Girl canoe, I made new seat frames and wove natural cane (rattan) in a standard 6-stage warp-and-weft pattern. 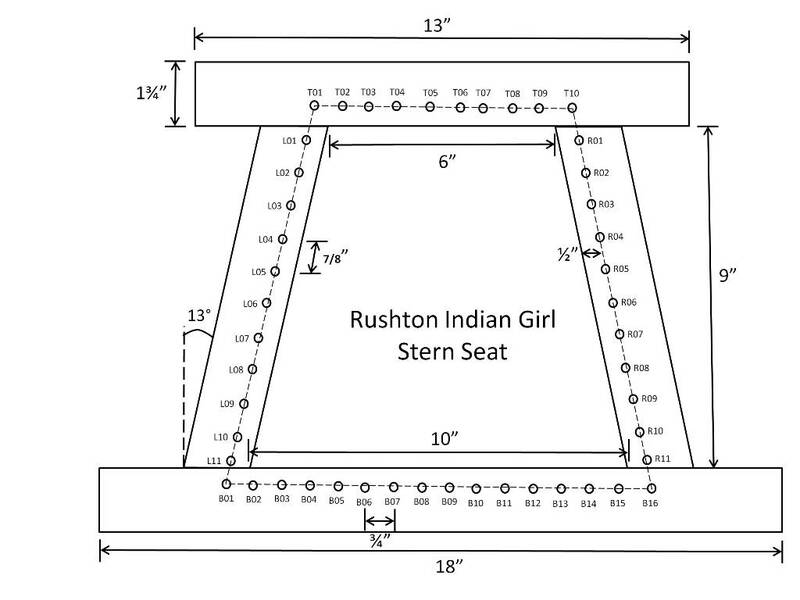 What makes these seats special is the trapezoidal stern seat. 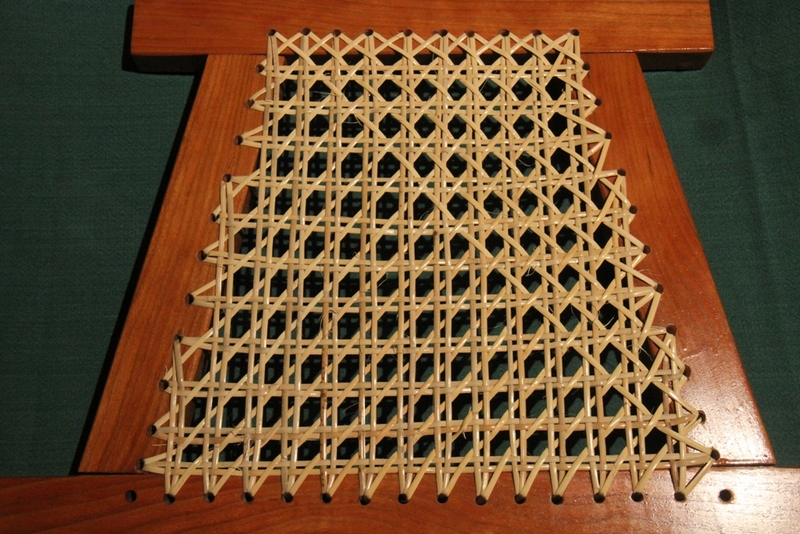 Weaving this seat has a number of unique challenges. 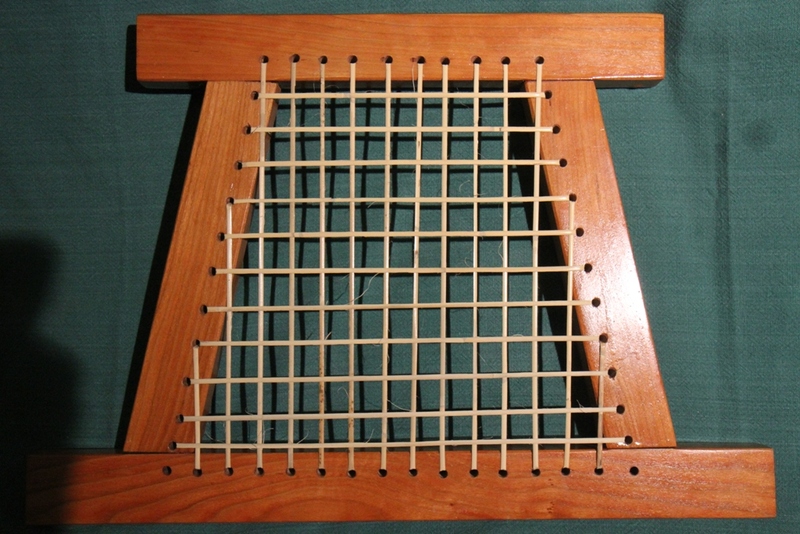 The Rushton seats are made of cherry stock 3/4″ thick and 1¾” wide. 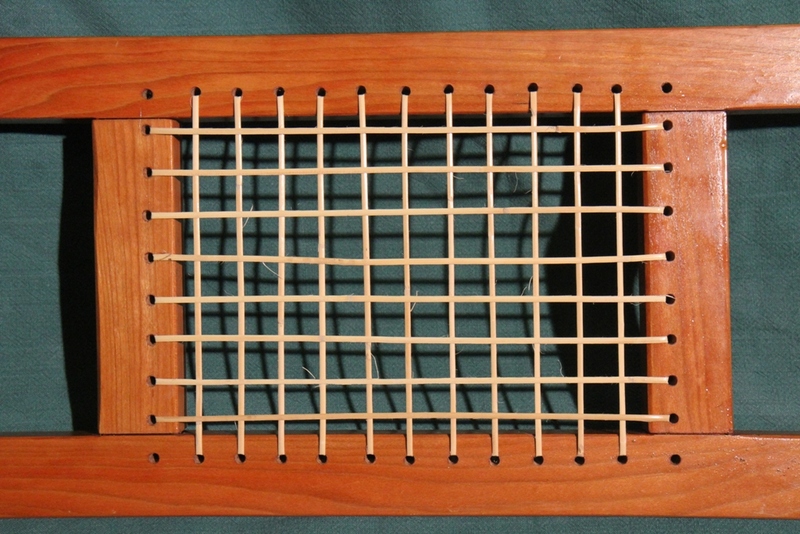 The holes are set ½” from the inside edge of the frame and are drilled with a 13/64″ bit. 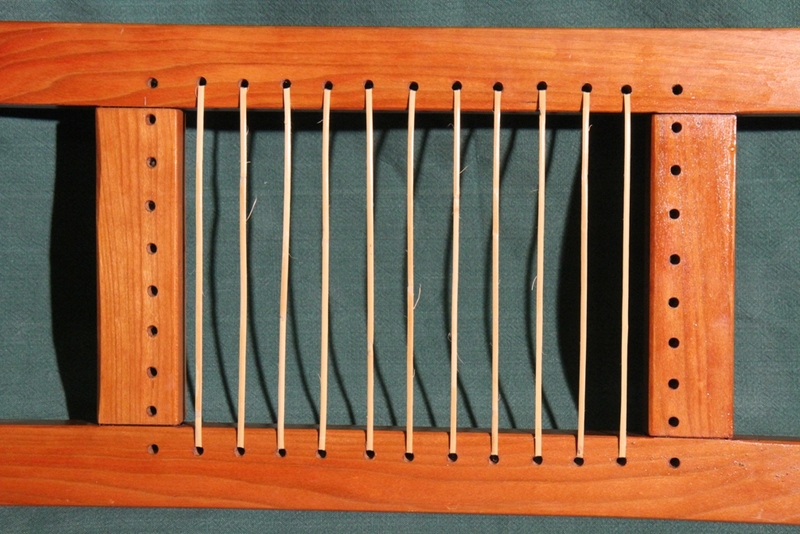 The holes on the top and bottom rails are approximately ¾” centre-to-centre while the holes in the side rails are set at 7/8″ intervals. 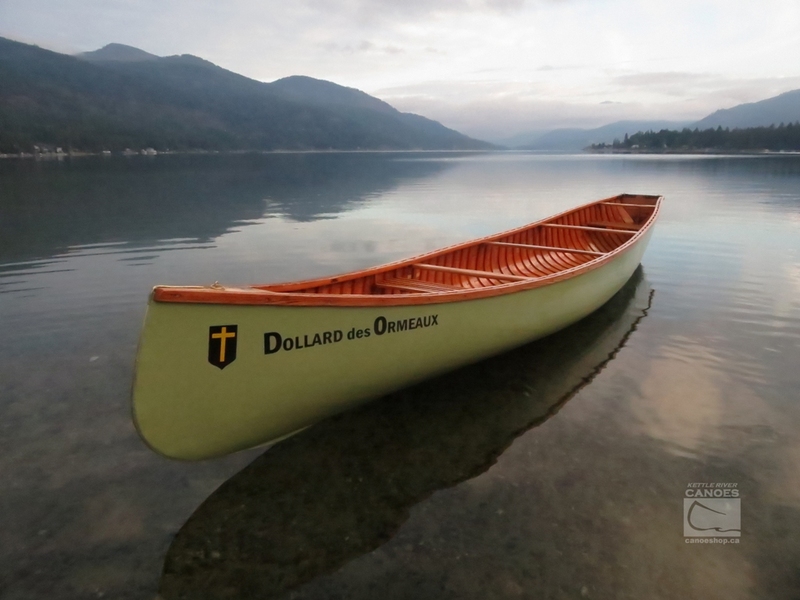 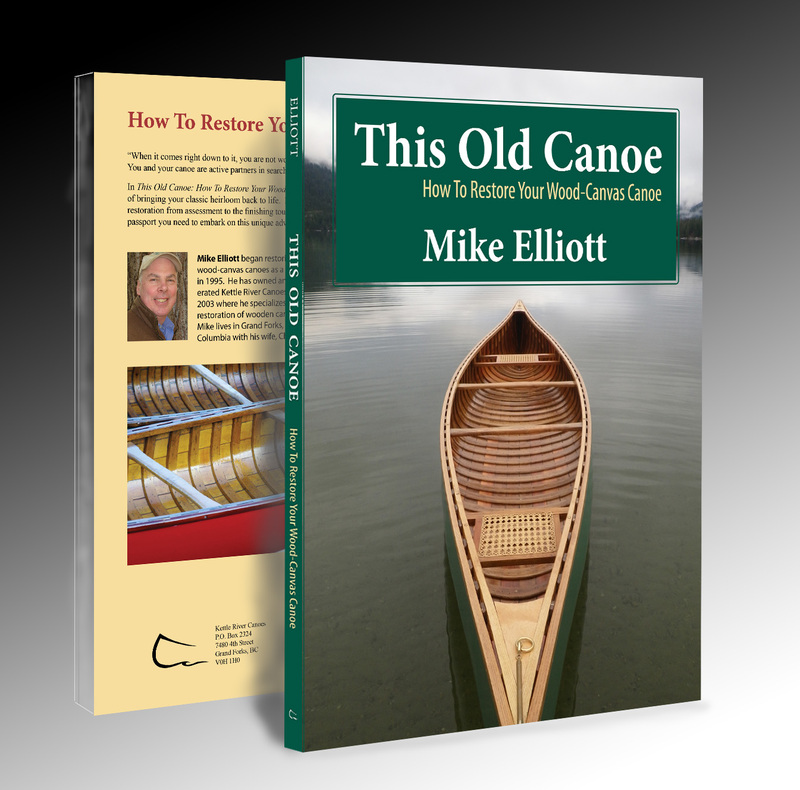 In my book, This Old Canoe: How To Restore Your Wood-Canvas Canoe, I describe the full process of preparing the seat frames, preparing the cane and handling the cane during the weaving process. 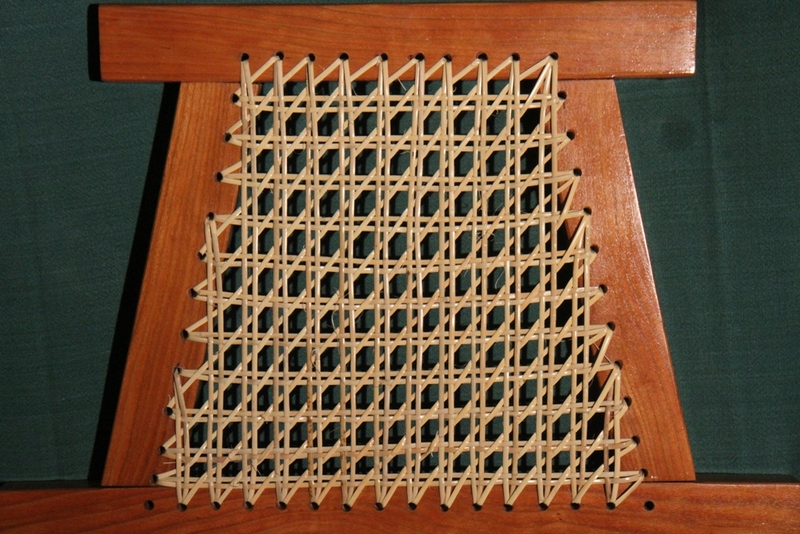 In last week’s blog article – September 08, 2017, I gave instructions on how to weave the standard 6-stage warp-and-weft pattern used in Rushton canoe seats (as well as many other builders in the USA). 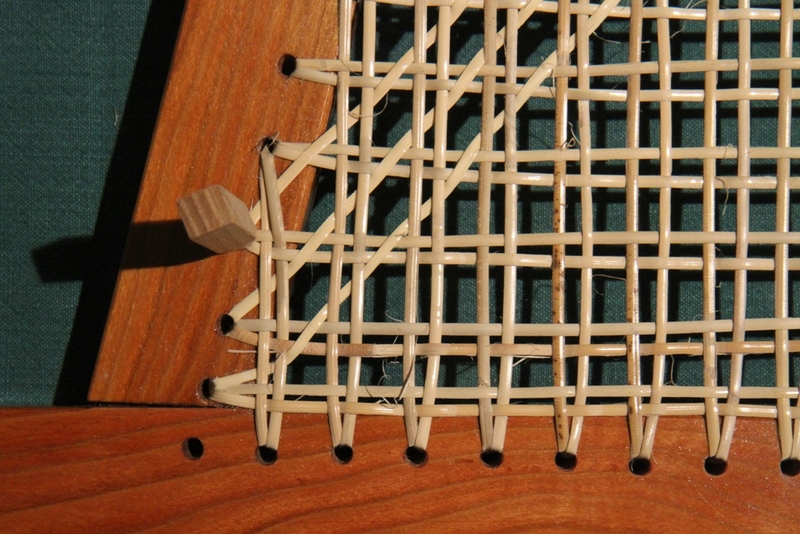 First Stage ̶ Begin by lacing vertical strands into each side portion of the seat. 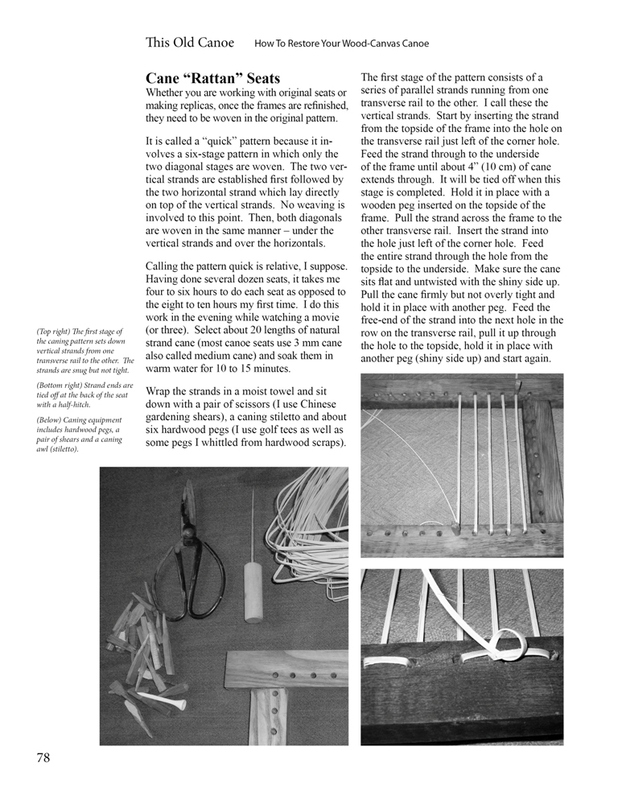 Anchor one end of the strand in R08 with a caning peg. 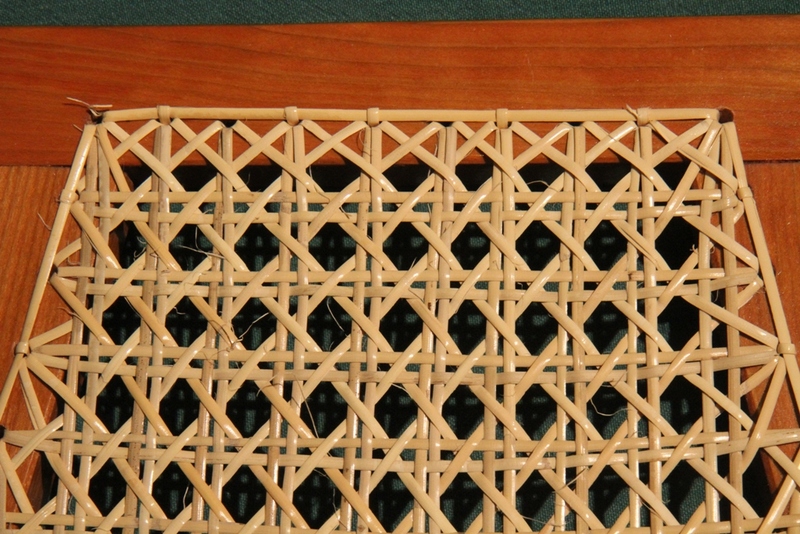 Be sure to leave 4″ (10cm) of cane extending out of the bottom of the hole. 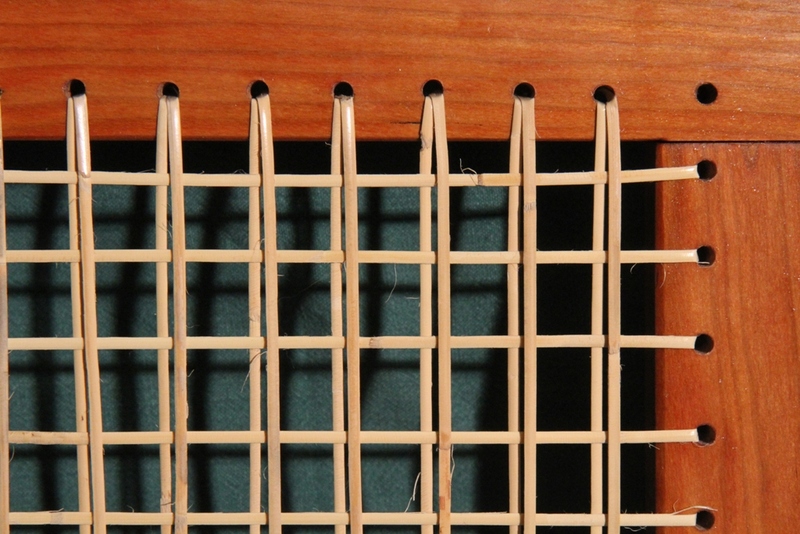 Set a vertical strand from R08 to B15. 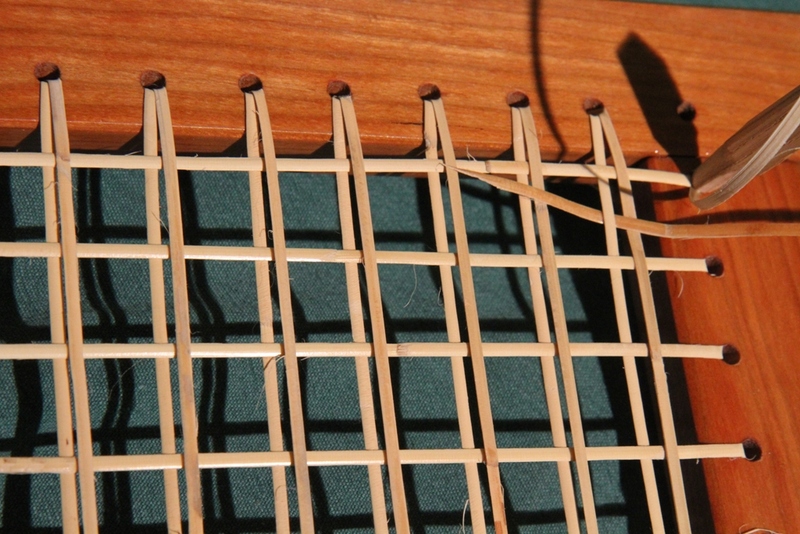 Lace the strand up through B14 to R04 and anchor the strand with a caning peg. 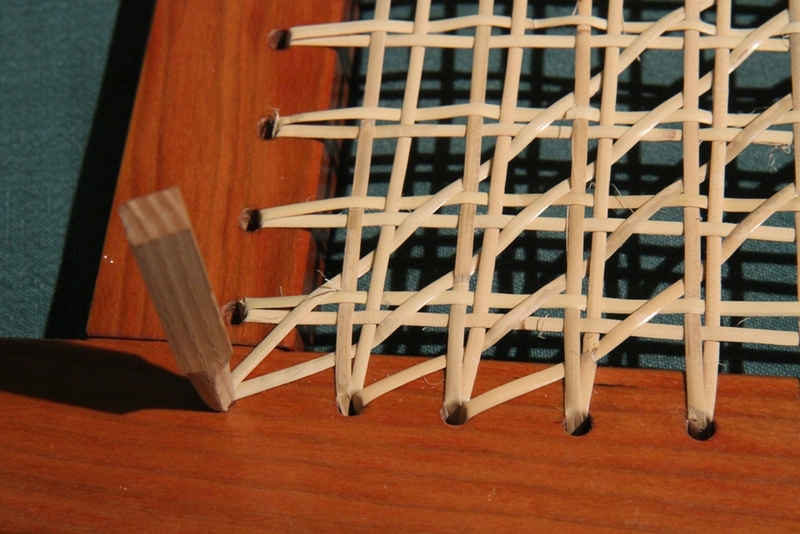 Again, be sure to leave 4″ (10cm) of cane out of the bottom of the hole. 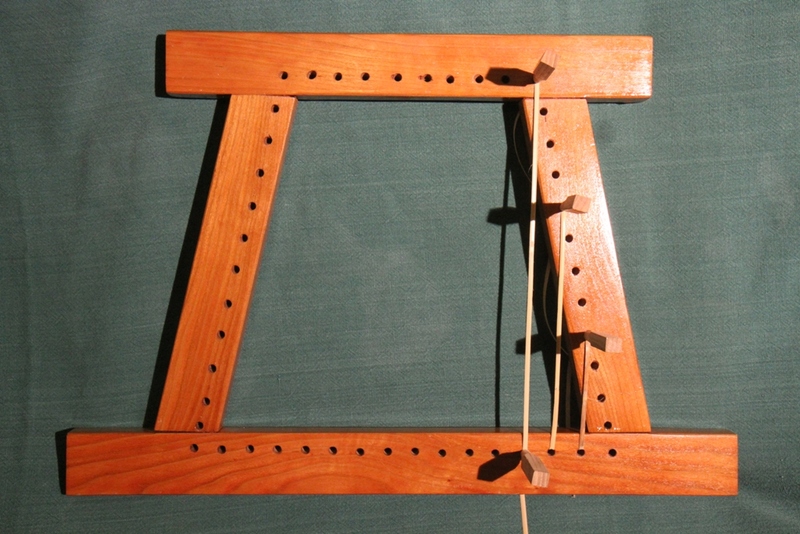 Next, anchor a new strand at T10 and create a set of vertical strands ̶ T10-B13, B12-T09, T08-B11, B10-T07, T06-B09, B08-T05, T04-B07, B06-T03, T02-B05, B04-T01. 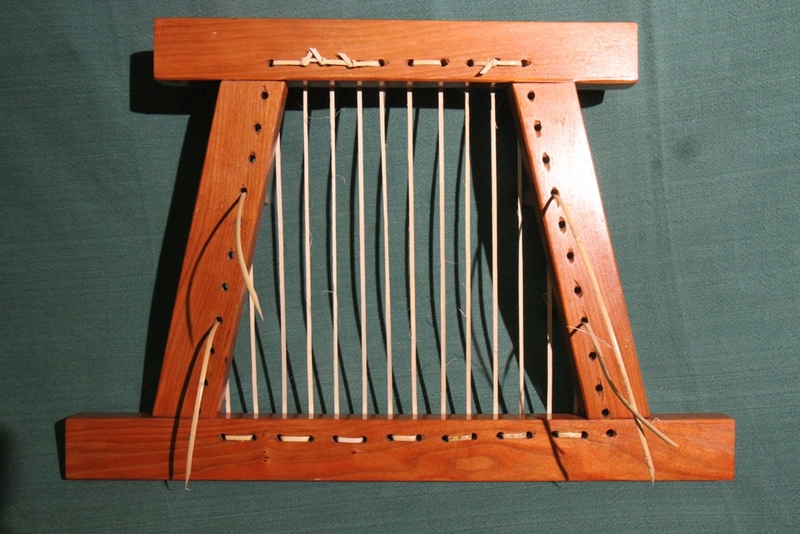 Complete the first stage by running vertical strands from L08 to B02 and from B03 to L04. 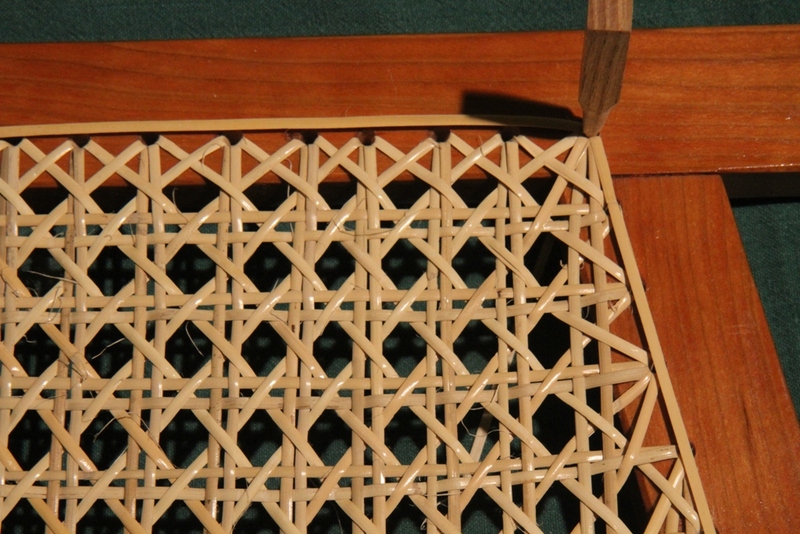 Again, be sure to leave 4″ of cane extending out of the bottom of L08 and L04. 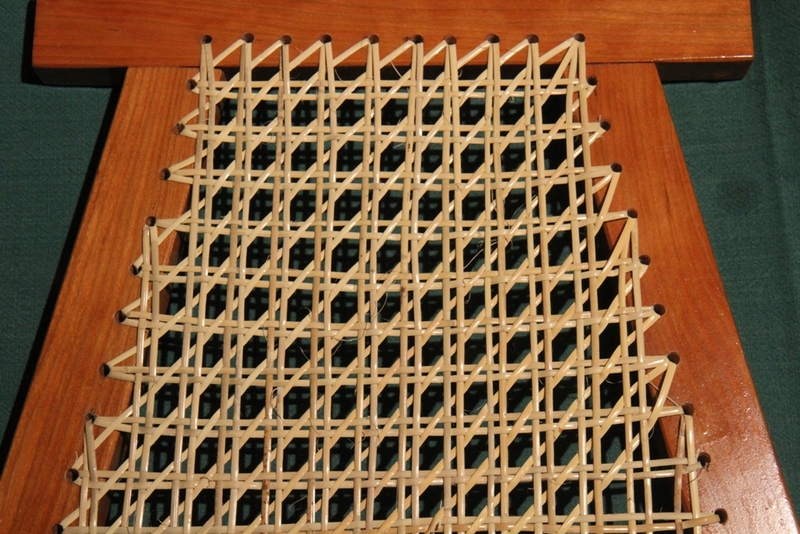 Second Stage ̶ Horizontal strands laid on top of the first stage strands. 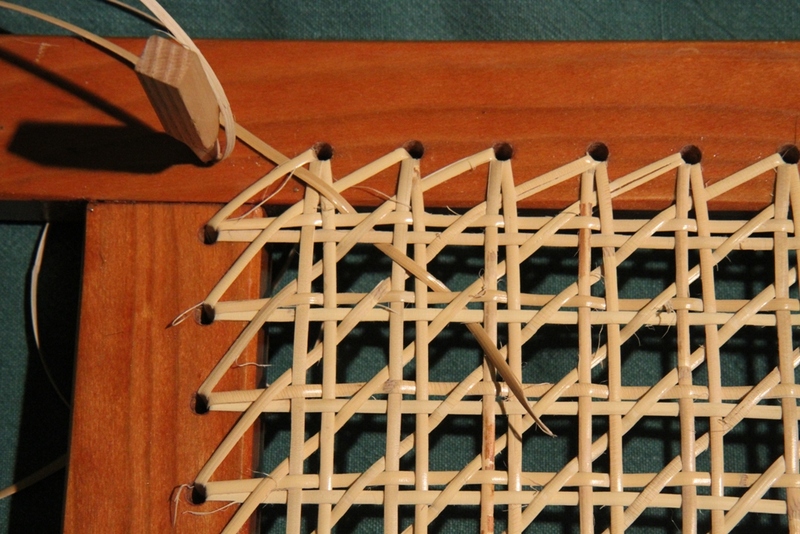 Once these strands are in, tie off the strands left from the first stage. 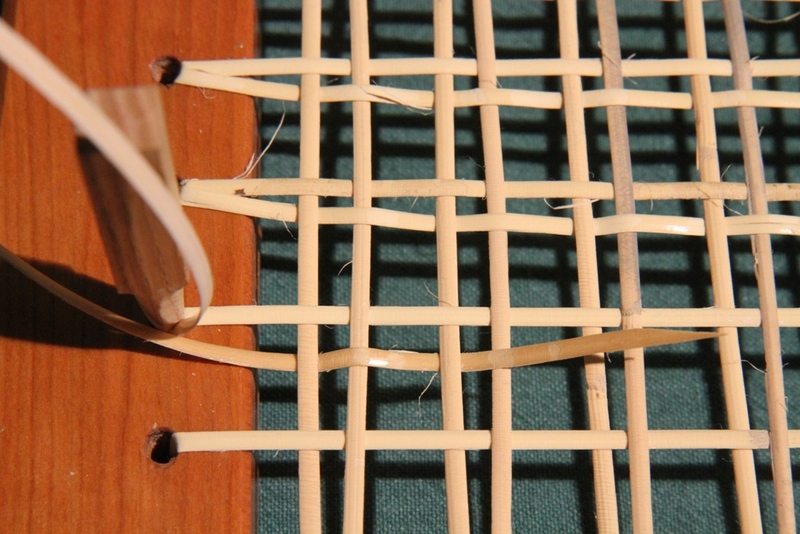 Third Stage ̶ Repeat the first stage and set these strands next to the first strands. 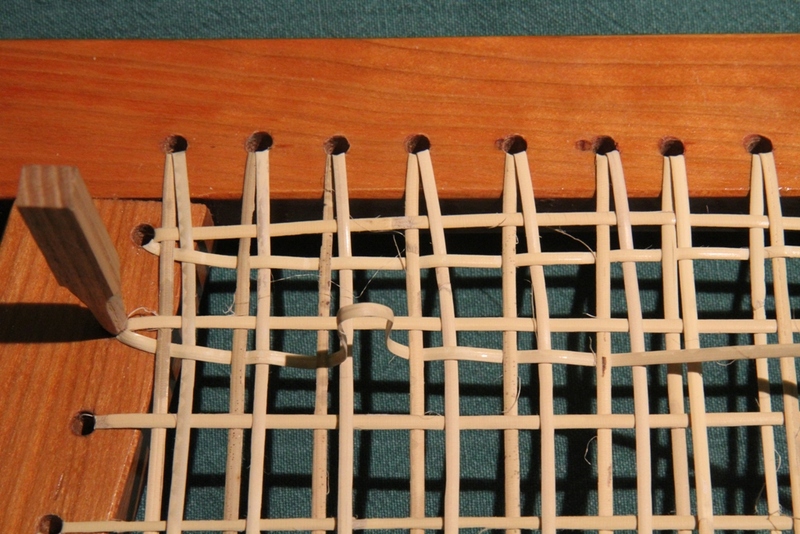 As mentioned in the previous blog, this creates the “warp” in the weaving pattern. 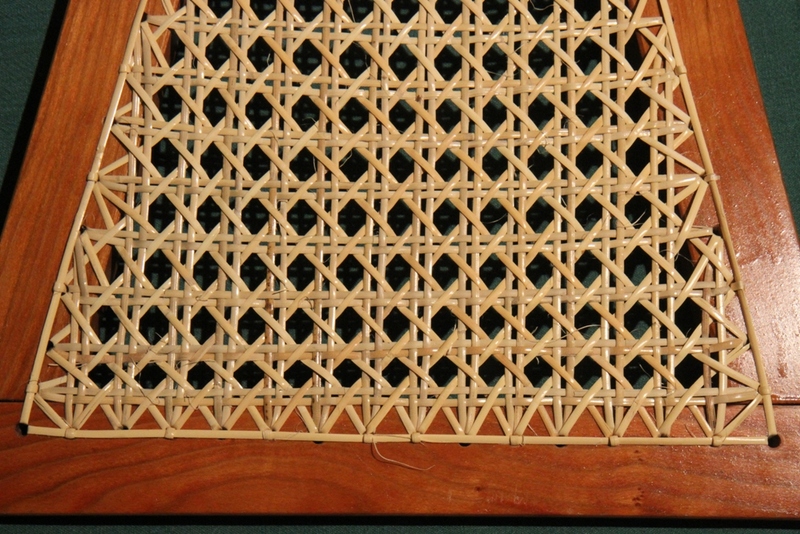 Fourth Stage ̶ Weave these strands next to the second stage strands as per the instructions in the previous blog. 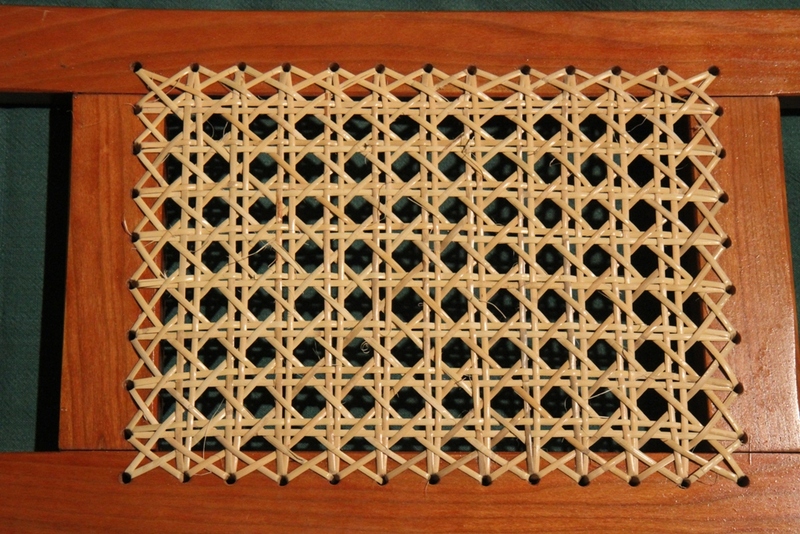 This creates the “weft” in the pattern. 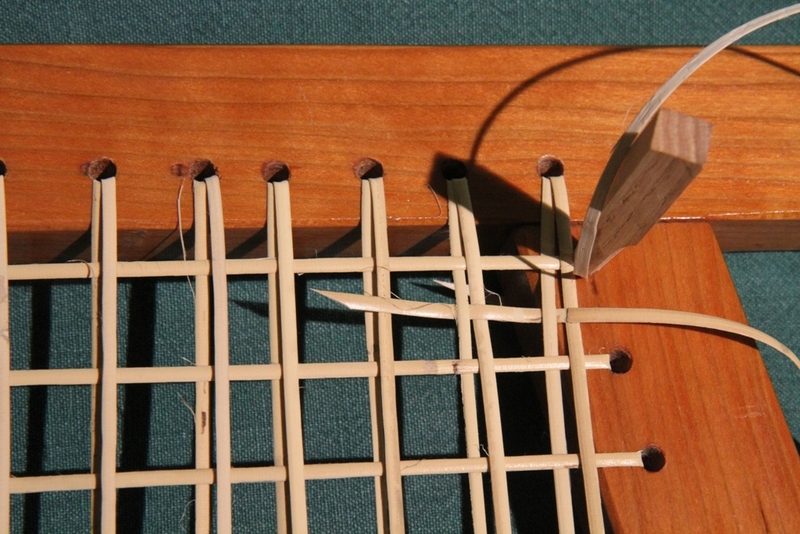 Weave through three or four pairs of vertical strands, then pull the entire strand through (firmly but not tight). 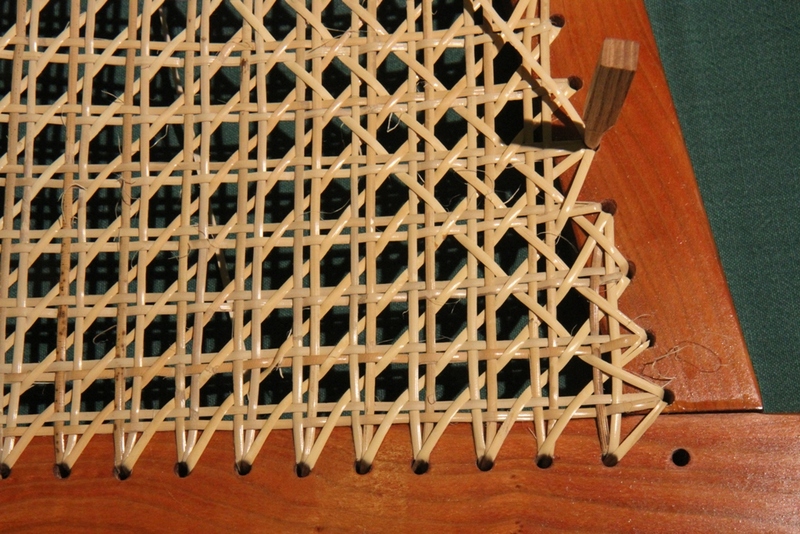 Continue until all of the side holes have two strands of cane woven from side to side. 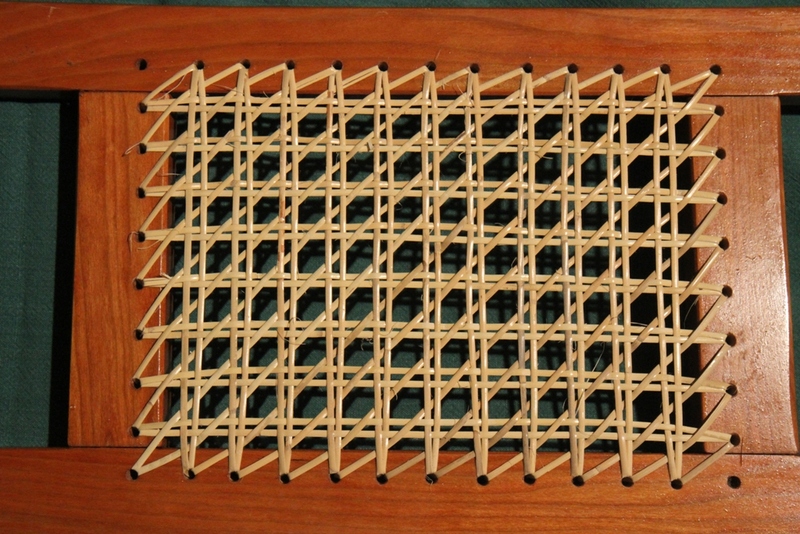 Fifth Stage ̶ Beginning in T10, weave under the vertical pairs and over the horizontal pairs until you reach L11. 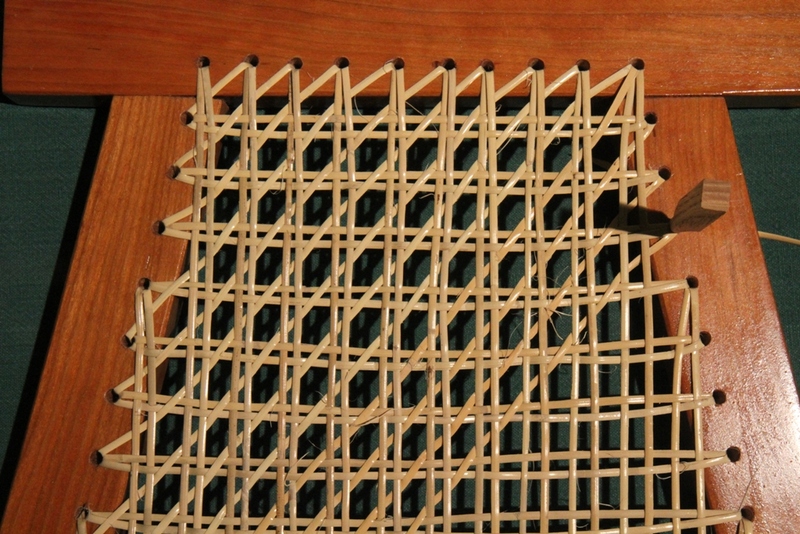 Then, weave from L10 to T09 and from T08 to L09. 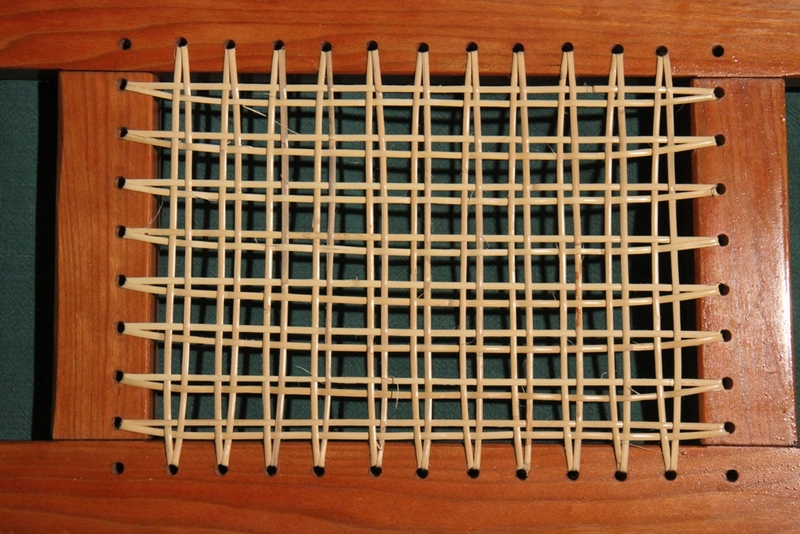 Skip L08 and weave from L07 to T07, T06 to L06 and L05 to T05. 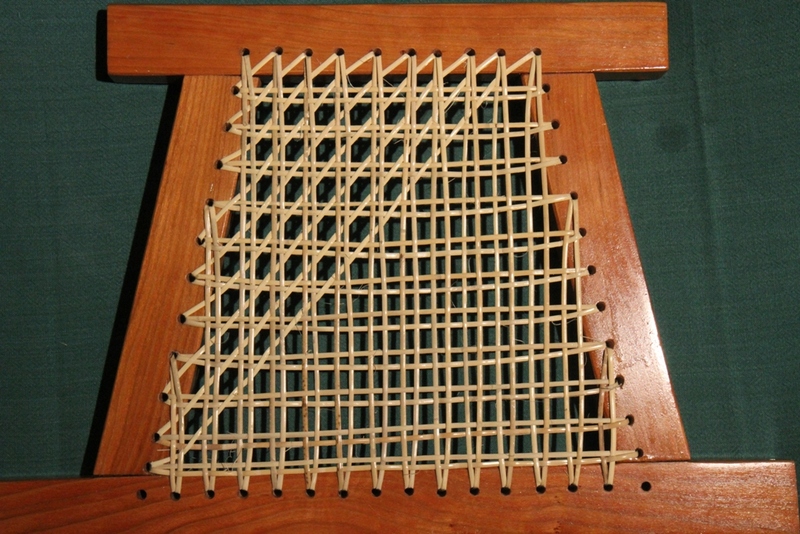 Continue by weaving from T04 to L03 (skipping L04), L02 to T03 and from T02 to L01. 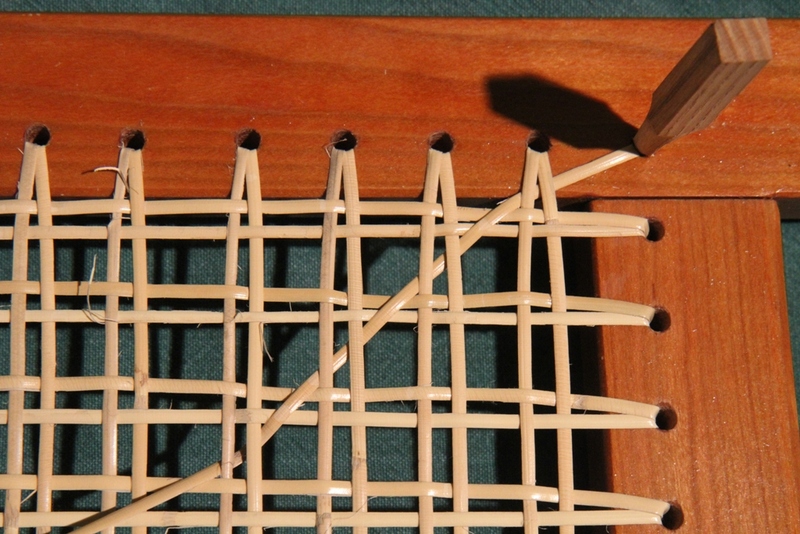 Starting again at T10, weave over the horizontal pairs and under the vertical pairs until you reach B02 (skipping B01). 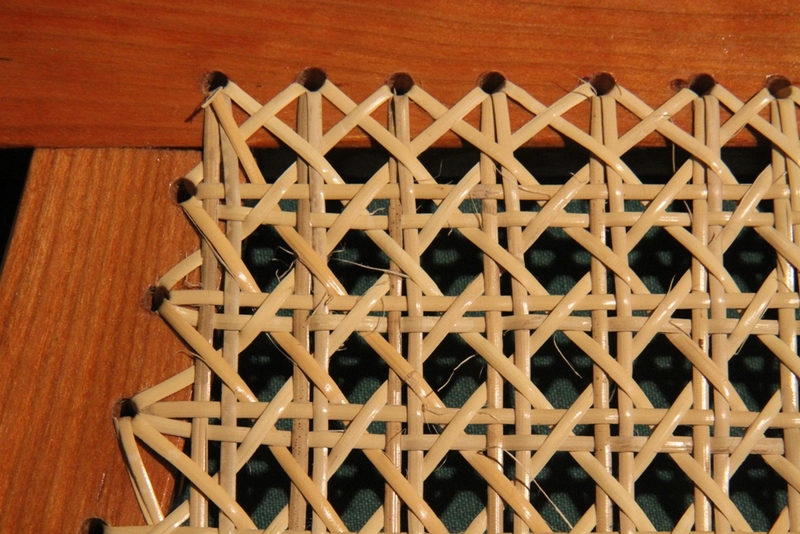 The next diagonal woven strands in the fifth stage are as follows: B03-R01, R02-B04 and B05-R03. 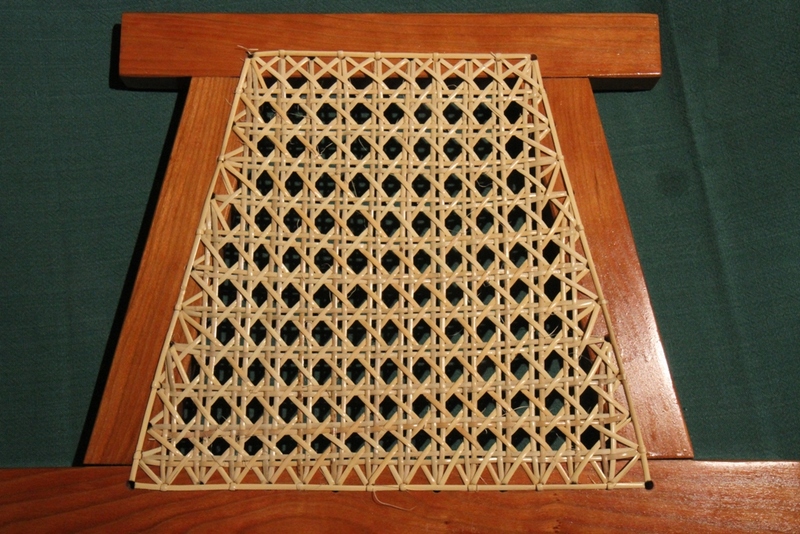 Next, weave from R03 to B06 (two diagonal strands in R03), then: B07-R04, R05-B08, B09-R06, R07-B10, and B11-R07 (two diagonal strands in R07). 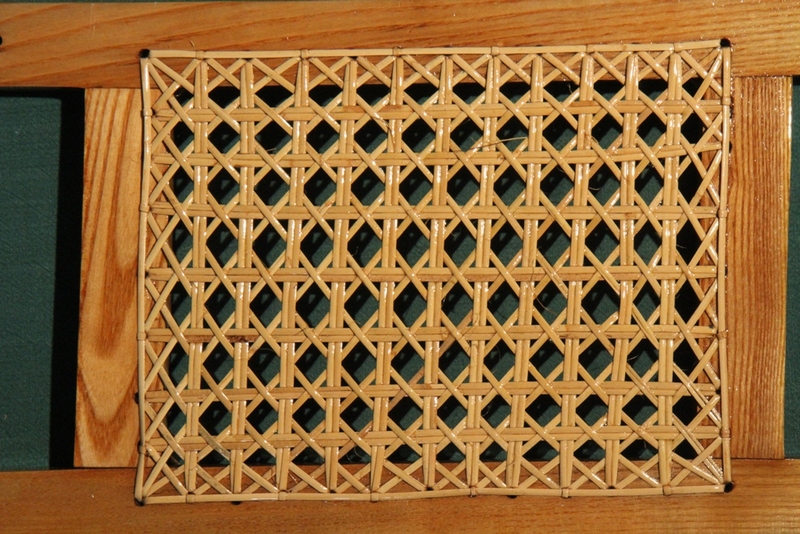 Continue the pattern as follows: R08-B12, B13-R09, R10-B14 and B15-R11. 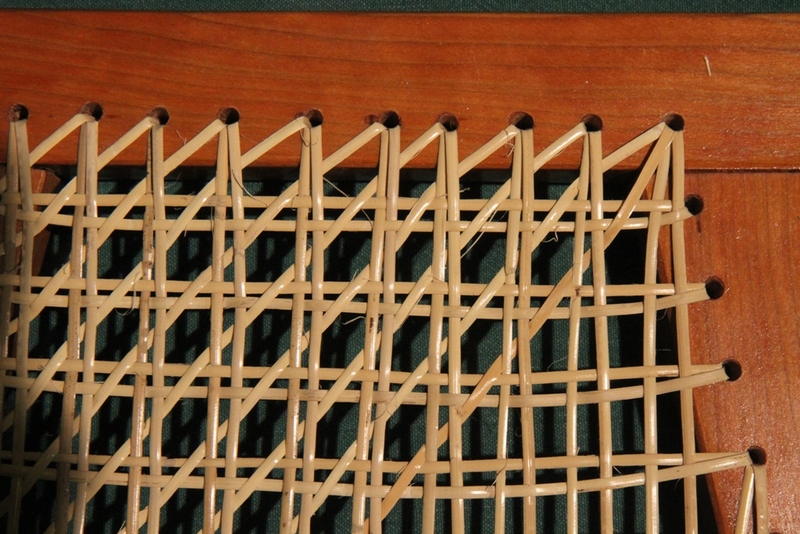 Skipping some holes in the side rails of the seat frame and doubling up in others, allows the fifth stage weaving to work out evenly through the trapezoidal frame. 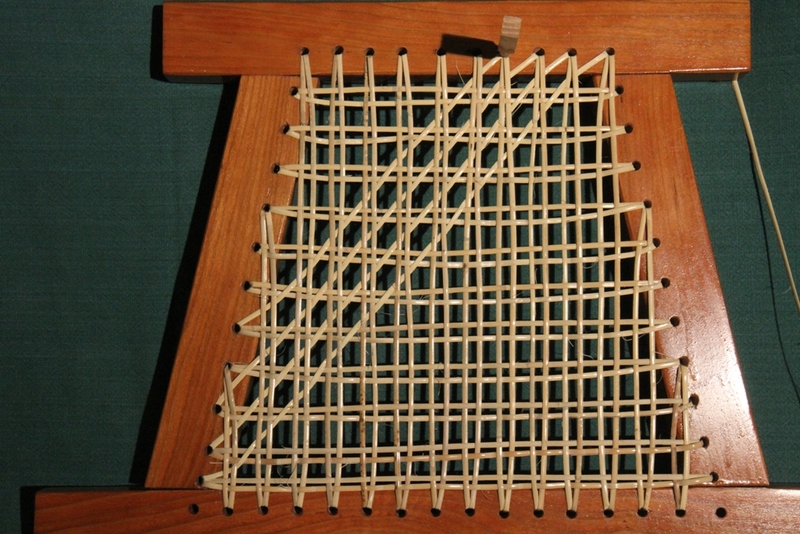 Sixth Stage ̶ This stage is the same as the fifth stage except the weaving goes over the vertical pairs and under the horizontal pairs. 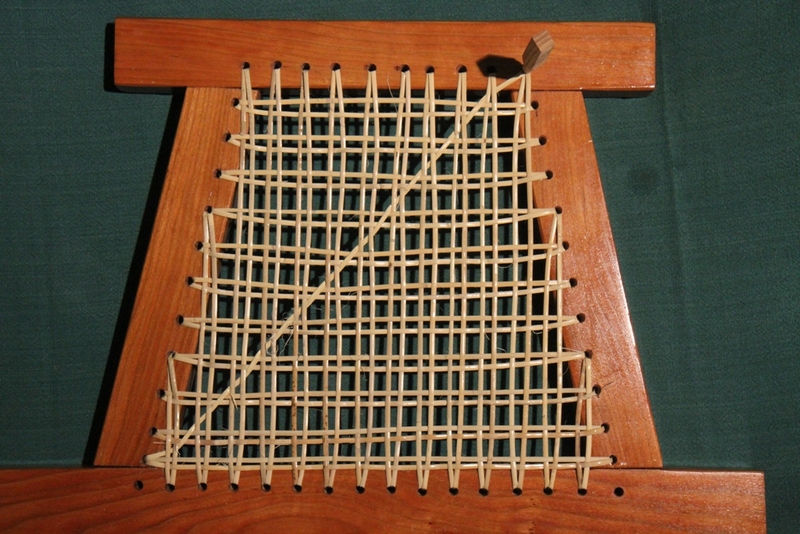 Starting at T01, the pattern is: T01-R11, R10-T02, T03-R09, R07-T04 (skipping R08), T05-R06, R05-T06, T07-R03 (skipping R04), R02-T08, T09-R01. 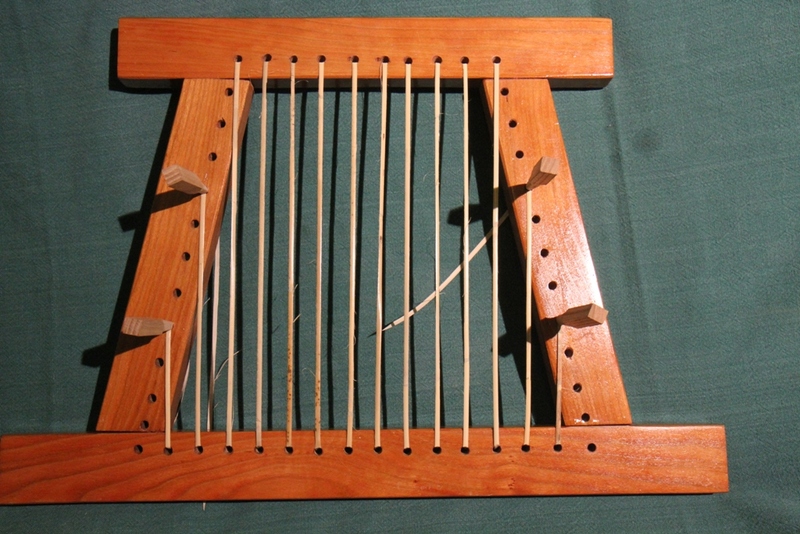 Starting again at T01, the pattern is: T01-B15 (skipping B16), B14-L01, L02-B13, B12-L03, L03-B11 (two diagonal strands in L03), B10-L04, L05-B09, B08-L06, L07-B07, B06-L07 (two diagonal strands in L07), L08-B05, B04-L09, L10-B03, B02-L11. 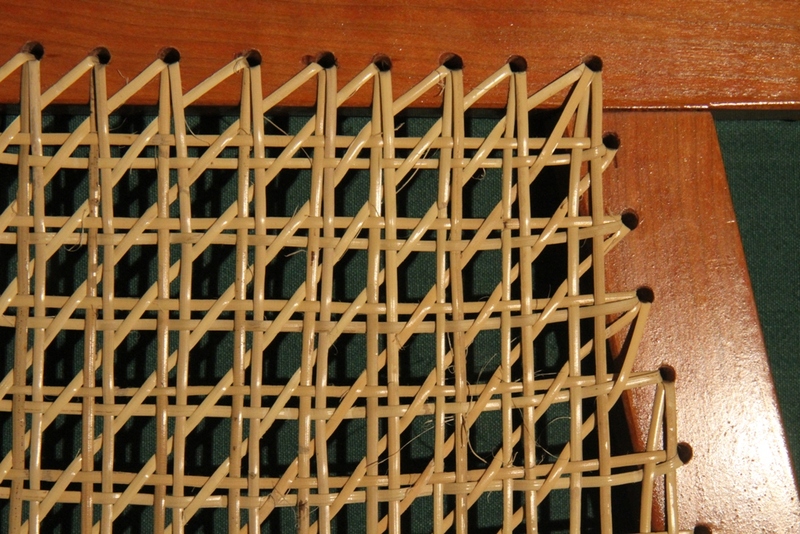 The border cane is set around the frame as usual with couching loops of cane in every second hole. 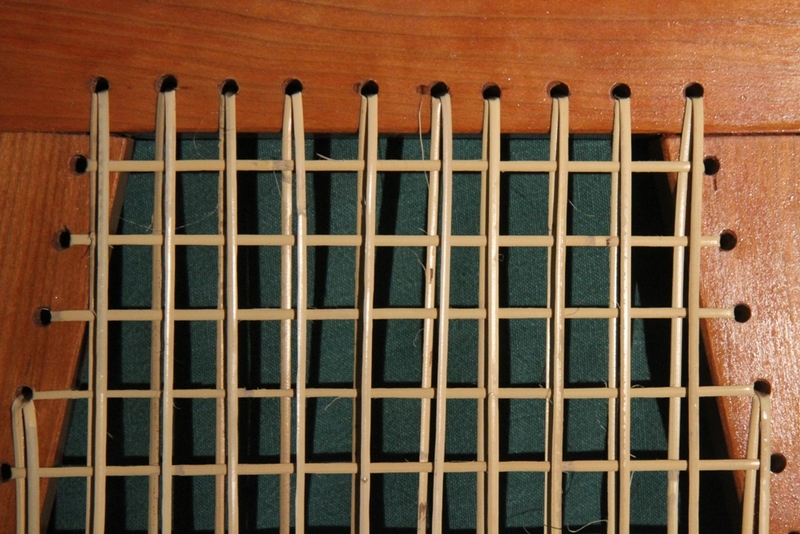 Note that both the top and bottom rails have even numbers of holes. 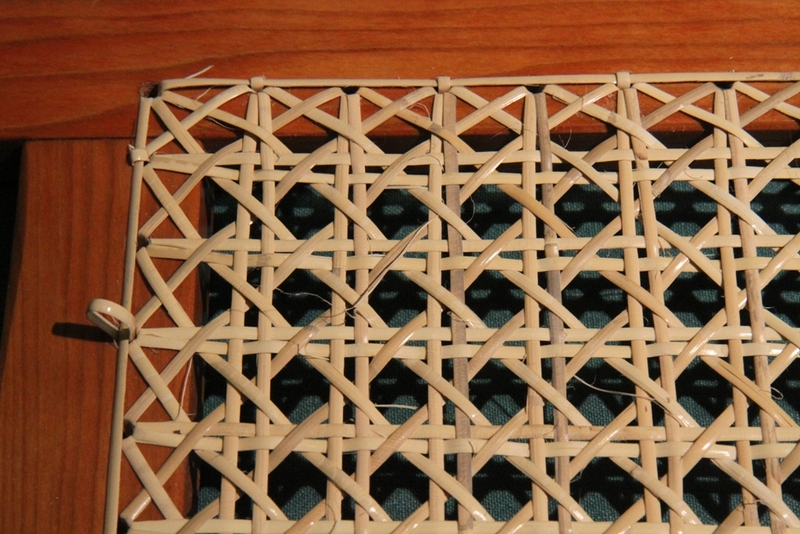 Therefore, I set loops of couching cane in T02, T04, T05, T07 and T09. 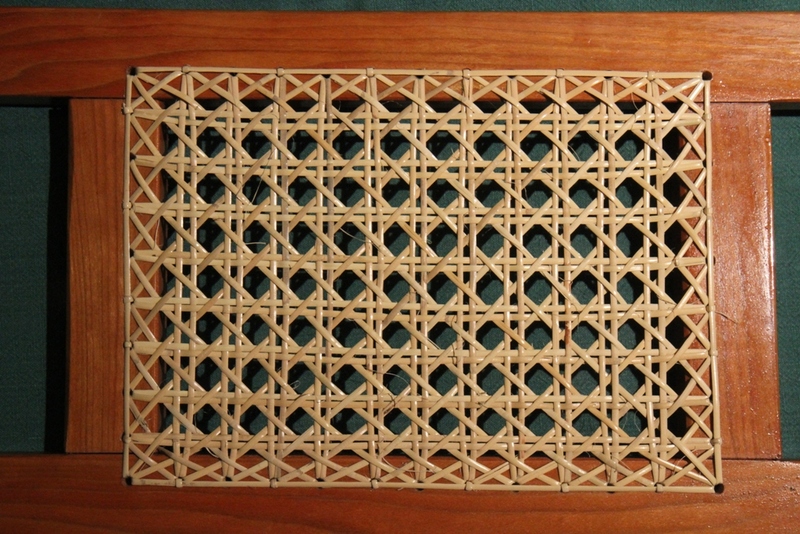 In the bottom rail, I couched the cane in B02, B04, B06, B08, B09, B011, B13, and B15.